DIY projects are becoming very popular but sometimes one can get confused if something can be done the DIY way or if you should get a professional to do it. This mostly happens when you don’t have the right set of tools that can help you make something that could seem rather difficult at first. DIY home projects help you save a lot of money. One of the ways to be efficient at DIY is to have a well-stocked toolbox. But it makes no sense to go to a store and buy every tool you see just because there might be a chance that you need it. It’s wiser to get the most useful ones that you will end up using again and again. We’ve prepared a list of the most basic and useful tools that will help you in every DIY project. Spray paint: Spray paints are great for any DIY starter kit. Stock up on all your favorite colors but make sure you store them properly. If you want a neat and tidy finish on your furniture or art make sure you make enough space to work so that the paint does not spill over and leave stains everywhere. Apply the paint in multiple layers to keep the drips away. Acrylic paints are also very helpful for a DIY project as they give a smoother texture and are less messy. However, it’s always good to wear a protective mask and gloves while using spray paint. 2. Hot glue gun: Some tools are way too useful to not have for a DIY. A hot glue gun will come handy for literally every DIY venture of yours. You might be familiar with a lot of different types of glue, but hot glue is from a different league altogether. The gun employs heat to melt chunks of a thermoplastic adhesive. It molds easily and peels off of almost any surface too. A must-have for your toolkit. 3. Tape: It’s surprising how much you can do with tape. It comes in handy for a lot of quick fixes and there are different types of tapes used for different DIY jobs. Duct tape is the super sticky tape that can be used for patching up a torn sheet to fixing the handle of a broken bucket. Then there is the painter’s tape that is primarily used to cover the edges of ceilings before painting in order to prevent spillage, and the electrical tape is used to insulate electrical wires. The most favorite of all tapes are the washi tapes as they are very versatile and come in various colors and the most adorable designs that can be of great use for craft. 4. Tape Measure: Precise measurements are very important in DIY projects. You will require a tape measure to put a picture in the right position, measure the size of a pipe, figure the area of a wall that you want to paint, or check the space where a new device has to fit. A good tape measure is essential for any home renovation job. For example, when you’re redoing your kitchen, you need to measure the size of various things: cabinets, counters, plumbing fittings, and the space between electrical outlets. 5. Tools and tool bag: There are some hardware and some tools that are just mandatory to complete your DIY kit. A hammer, some screwdrivers, a utility knife that helps you in opening boxes and evenly cutting wallpapers, a putty knife that can be used to scrape off extra paint or wallpaper and a plier so that you can easily grasp onto something and pull or turn it around. These tools are essential when it comes to remodeling your house. Once you have gathered a complete set of tools, you will need something to store them in which should ideally be robust and easy to carry around. 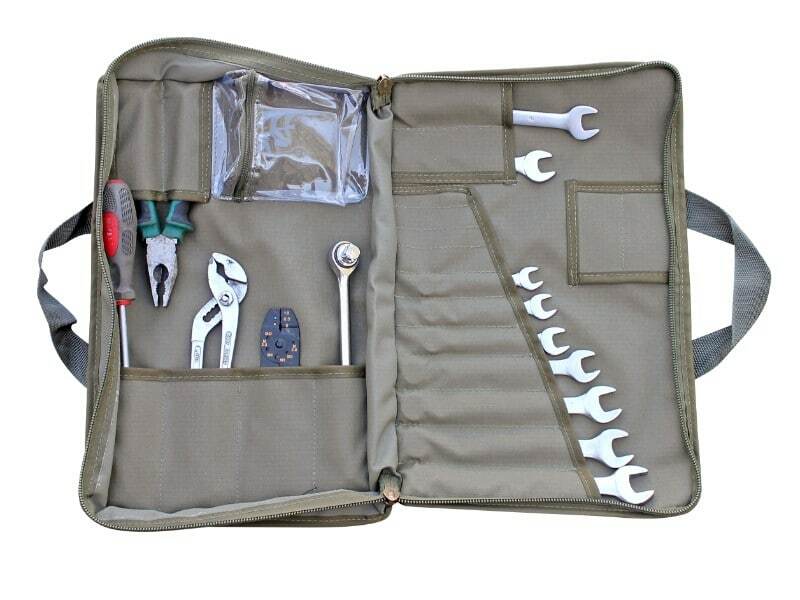 A good waterproof tool bag that offers well-organized access to your tools is a must-have for every DIY enthusiast. It can be very annoying to go botching through a cluttered box looking for the right tool in the middle of a job. Which is why you need a toolbag that stores all your tools so that you can get on with the job faster and protect the tools from damage in between uses. You must only invest in tools that you know you will use regularly or it becomes a total waste. Most importantly, do remember that having a bunch of tools merely is not enough. It only makes sense if you also know how to use them. Therefore, as you add on to your toolkit, build on your DIY abilities as well.